I have a coat closet by my front door. The thing is very dark at night and really needs some kind of illumination inside. I could hire an electrician to install a light in the closet ceiling and then wire it to a toggle switch outside the door but that would cost me quite a bit of money. That doesn’t sound like a good investment for something which does not get much use. I looked around for some battery powered LED lights which would emit enough light for the small space and I found one made by Sylvania. I think it will do the job. I figured I could mount one or two of the things in the closet and connect them to a pushbutton activated timer circuit. A tap to the timer’s switch would turn on the light for some period of time, and then turn the light off. This timing function would insure that the light would not be accidently left on, which would kill the batteries after a few days. Since I would not need to use the light very often, the set of batteries in the light should last for many years. As shown below, the Sylvania “Light Flute” has four bright white LEDs, housed in a nice cylinder about half an inch in diameter and about 9 inches long. It is powered by 3 AAA 1.5v alkaline cells, which snap into holders inside the housing. It has an on/off switch on one end. The light assembly can be snapped into a plastic holder but I was planning on mounting the light right above the inside top of the door molding, so the lights would shine up to the ceiling. The diffuse light would then provide illumination to both the shelves in the closet and the coat rack below. I bought one of these things and tested it in my closet. It did indeed produce enough light. If my wife says that she wants even more light, I could wire the timer circuit to two such devices, which would double the illumination level. I sketched up several ways to go with the timer design. One classic timer circuit requires three wires soldered to the light assembly. The timer circuit would draw power directly from the light fixture. In two other designs only two wires would need to be connected to the light. One circuit used a quality super capacitor with a low leakage current feature while a third circuit used a coin style 3v lithium battery to power the timer circuit. If I carefully designed the circuit for an ultra low current draw, the lithium battery might outlast the batteries in the light fixture, perhaps up to 10 years. After some head scratching, I decided to use the design with a 3v lithium battery. The timer circuit I came up with is shown below. It uses a tiny LMC7215 ultra low power voltage comparator from National Semiconductor. The non-inverting input is connected to a half supply reference while the inverting input is connected to a RC timing circuit. When the trigger switch is pressed, the timing capacitor C1 is discharged. In this state, the output of the voltage comparator swings high, which turns on the transistor Q2 through R4. The transistor Q1 and the resistors R5 and R6 form a constant current sink circuit, set at about 150ma. 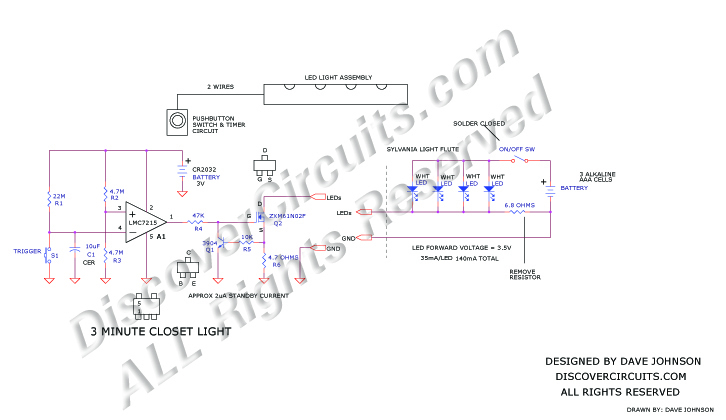 The LED light circuit is modified by unsoldering its 6.8 ohm resistor and shorting out the on off switch. The capacitor C1 should be a low leakage tantalum or a surface mounted ceramic. I measured the standby current for the circuit at about 2 microamps. This is such a low current that the 3v lithium battery should last for at least 5 years. I measured the total current going into the 4 white LEDs at about 150ma. If I use 800ma-hours as the capacity of the 3 AAA cells, the batteries should have enough energy for at least 1000 light operations. That means the batteries should last about 5 years.